Along the path from Boathouse Corner to Hemelite Bay, you will see the shiny, bright yellow petals of Marsh Marigold bringing bold splashes of colour to the edges of the pond. 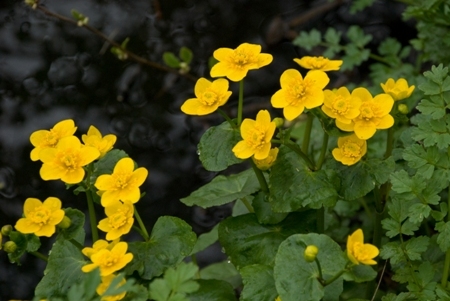 A member of the buttercup family, this ancient native plant, also known as Kingcups, May-bubbles, and Mollyblobs appears in early spring and is sometimes still in flower late into the summer months. Its sturdy, dark green, heart-shaped leaves offer shelter to frogs and other pond creatures. Also making an appearance at Hemelite Bay, and on the banks of the smaller pond to the side, is the Cuckoo flower. 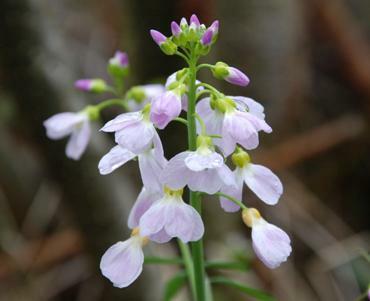 Commonly known as Lady’s Smock, it has pretty, pink cupped or ‘frocked’ flowers. These pale blooms attract moths and early-flying butterflies such as the Orange-Tip, as well as bees and flies. 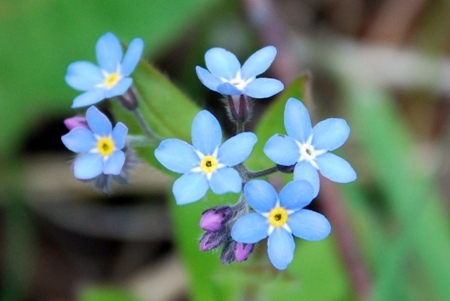 Adding colour to the woods and along the banks of the Brookly Stream are masses of tiny Forget-me-nots. The five sky-blue petals of the Forget-me-not fuse at the base to form a very narrow tube and the five yellow scales form a ring at the entrance of this tube. The golden colour in the centre of the flower attracts pollinating insects and is a nectar source for early solitary bees. 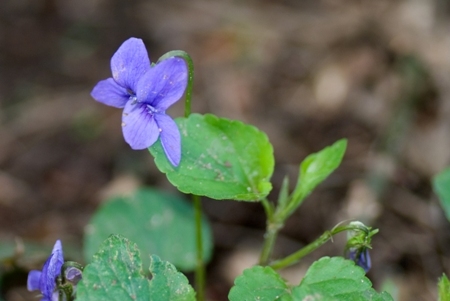 Common dog-violets are currently peeking out from under the boardwalks around the Gelvert Stream and Sandy Bay area. Unscented, these are one of the commonest violets and can be identified by the curved, paler spur at the back of the purple petals. The leaves of violets are a vital food source for the caterpillars of certain butterflies, particularly the Fritillaries, as they thrive for many months after the flowers have faded. Next month, look out for Bogbean and the dreaded Skunk Cabbage. FPS Photography Competition 2009 – All Welcome! These photos (click to enlarge) won the (adult) Fleet Pond Society photography competition last year in their respective categories (Quiet Corners, Reflections and Shadows, and Shoots and Leaves). Could you win this year? Full details of how to enter this year’s competition are here (Word version) and here (pdf version). The full set of winning and highly commended pictures for the 2008 competition (adult and under-16) are available here. April Volunteer Event – Saving Our Banks! Even though it was Easter Sunday, there was a very good turnout! 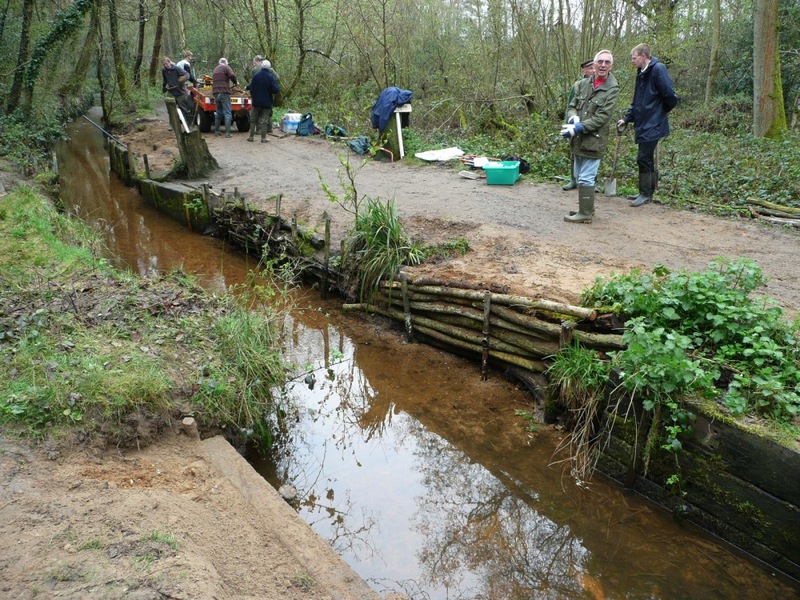 The aim of April’s task was to repair the stream banks (on both sides) near the Gelvert Bridge (see map on About page above). These have become badly eroded by the floods of last season and temporary repairs were needed. When the rangers have enough funds, the overflow problem will be handled by raising the bridge (other solutions are also being considered). Poles were driven in to the sides to allow insertion of a sleeper on one side and old logs on the other. The sleeper was extremely heavy as it was waterlogged – so plenty of hard work was required (see photo below). 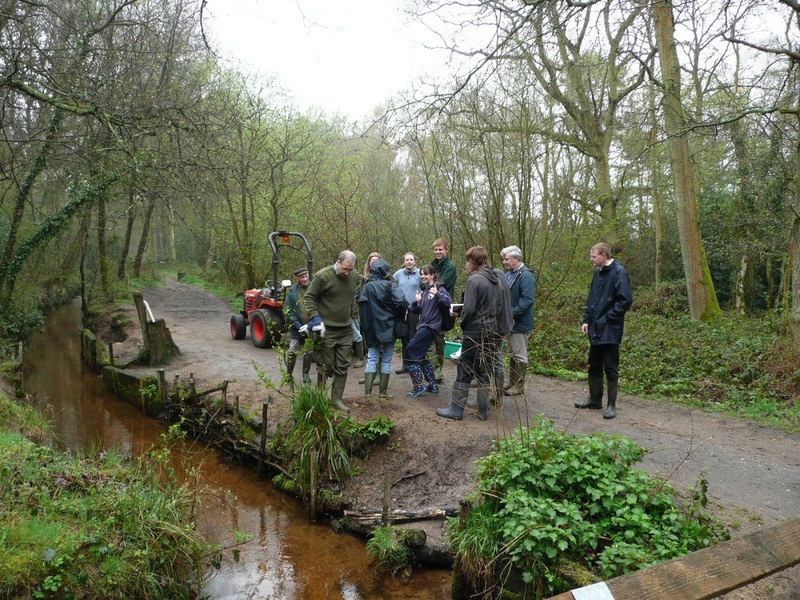 The infill material was taken from Sandy Bay using a tractor and supplemented by overflow sand from the side of the bank itself. This task was a project under the CSV Action Earth initiative (Title: ‘Save Our Banks’). 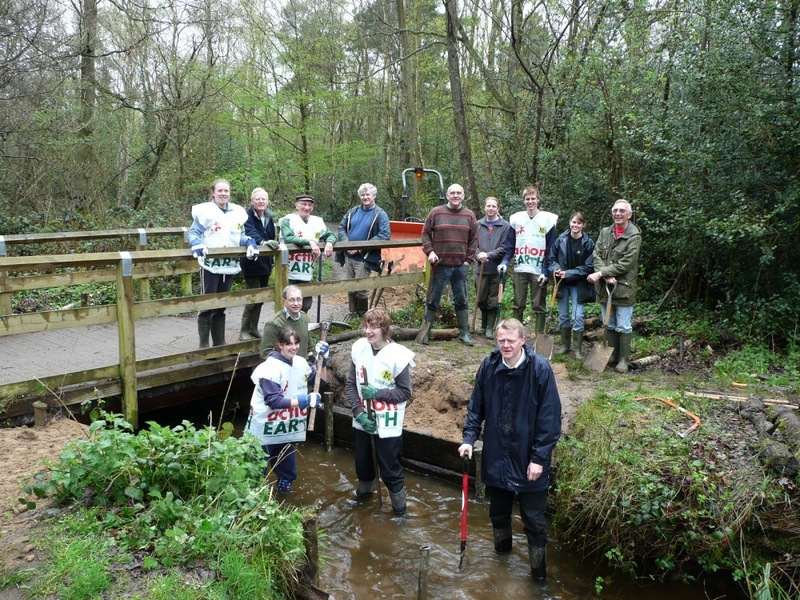 Action Earth provides grants of up to £50 (funded by Morrisons) to assist groups in England, Scotland and Wales in carrying out environmental projects. 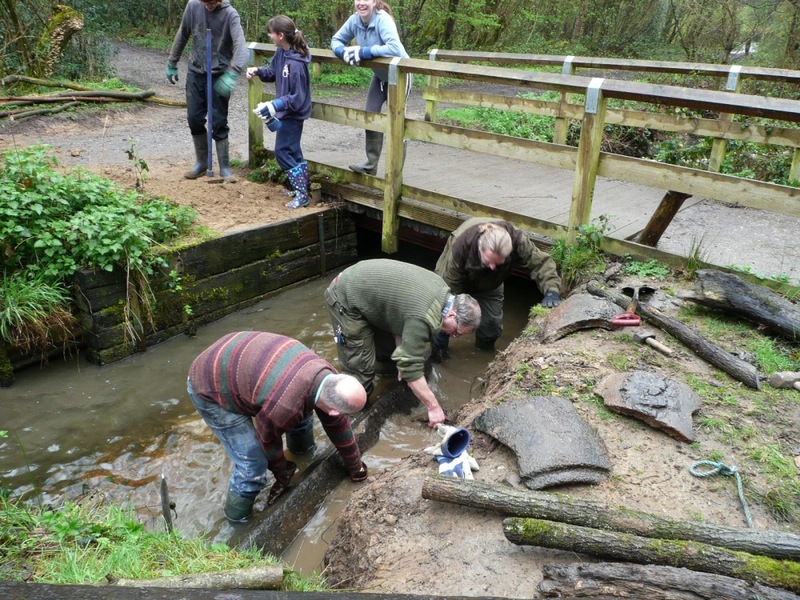 Information on a previous Action Earth task carried out by Fleet Pond Society is here. Picture: Group Picture (CSV Action Earth). Picture: The Final Results – A Good Job Done! I appreciate that getting out of bed on a Sunday morning to do conservation work may not be to everyone’s taste but, take my word for it, working in an easy-going team and making a real difference can be very satisfying and we’re always keen on new volunteers! Contact details on About page. If you catch the scent of fried onions as you walk through Brookly Glade this week, it’s not your imagination. Amongst the beeches in the glade, alliums are currently in flower and giving off a strong, oniony fragrance. The variety here is the Caucasus immigrant, Allium paradoxum, known as Few-flowered leek or garlic. 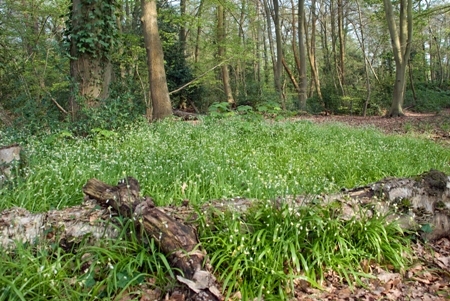 Part of Brookly Glade was once a privately owned garden, hence the number of imported flora in this part of the nature reserve. The British variety, Three-cornered leek, has a three-cornered cross-section of the stem and is larger and smellier than our imports. After I’d photographed the alliums, I turned to find I was being watched. 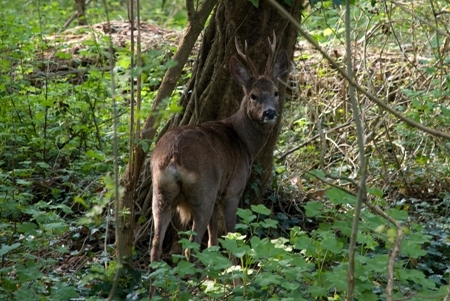 A pair of roe deer were standing under the trees on the other side of the fence, enjoying the sunshine. They didn’t appear to be disturbed by my presence and this fellow obligingly posed for the camera. 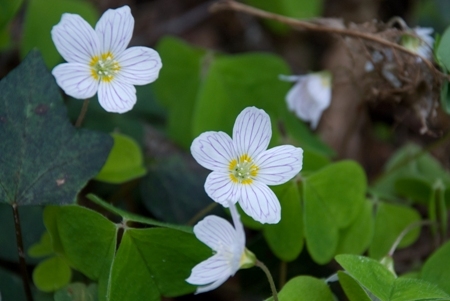 The flowers of Wood sorrel (Oxalis acetosella) traditionally appear between Easter and Whitsun. This has led to the plant becoming popularly known as Alleluia throughout Europe. This Easter, the delicate white, veined flowers can be seen in clumps either side of the path that runs alongside the Gelvert Stream passed the bridge towards Sandy Bay. 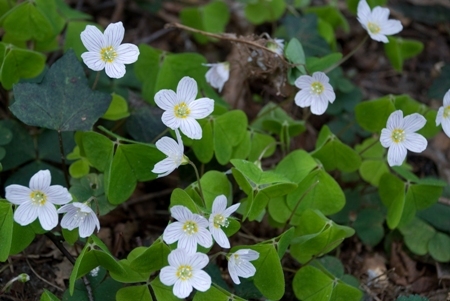 A shade-loving plant that often forms large groups, Wood sorrel loves damp, mildewy soil and can grow in locations that see only one percent daylight. The distinctive leaves of Wood sorrel have led many botanists to suggest that it was actually the original Irish Shamrock, rather than clover. St. Patrick is thought to have used the trifoliate leaves of Wood sorrel as his visual aid when he preached the Holy Trinity. The three drooping, heart-shaped leaves are connected to the leaf stalk by limbs that undergo different movements. In normal shade or diffused light they lie fully open, whereas at night or in direct sunshine they droop downwards and fold onto their stem in a ‘sleeping position’. You are currently browsing the Fleet Pond Blog blog archives for April, 2009.